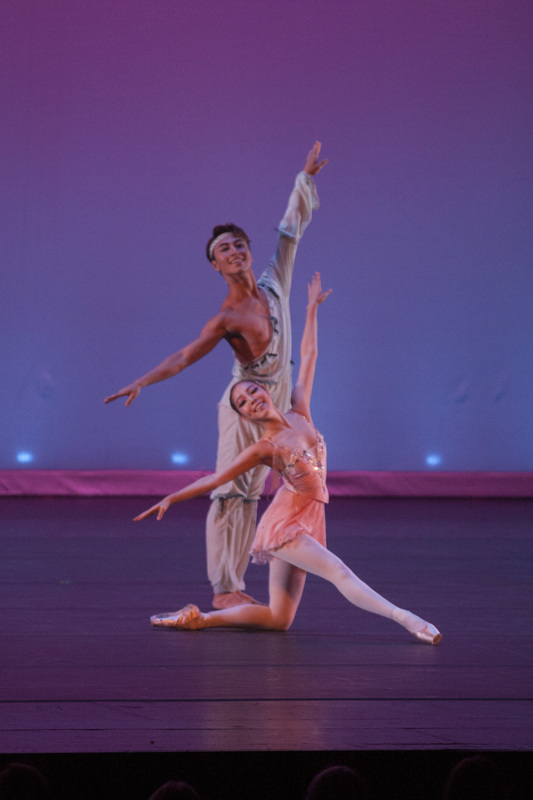 ‘Duende’, that elusive quality of heightened awareness and inspiration, was in the air at the 20th International Ballet Festival of Miami, which included Korea, Spain, Germany, France, Argentina, the Netherlands, Italy, Hungary, and Mexico. Pedro Pablo Peña, Festival Founder and Artistic Director, presented a truly international experience over 16 days that ended with a Gala of the Stars. Peña was born in Cuba and has received many awards for his artistic achievement – the festival is a crowning example. And Miami, an international city, was the perfect host for the festival. The audience at the Gala was as international as the festival itself. It was an ideal fit for an event filled with artists who gave stellar performances. “Skin” presented by the Bavarian State Opera Ballet (Germany) by Ivan Liska Artistic Director and Choreography by Luc Bouy was performed to music by Samuel Barber-Adagio for Strings. Barber’s Adagio for Strings is a piece filled with sorrow, calling out to be heard. “Skin” was a piece with the dancers calling out not to be separated. It began with a couple seated and wrapped tightly together. Their movements never took them far apart. Were they afraid to let go? 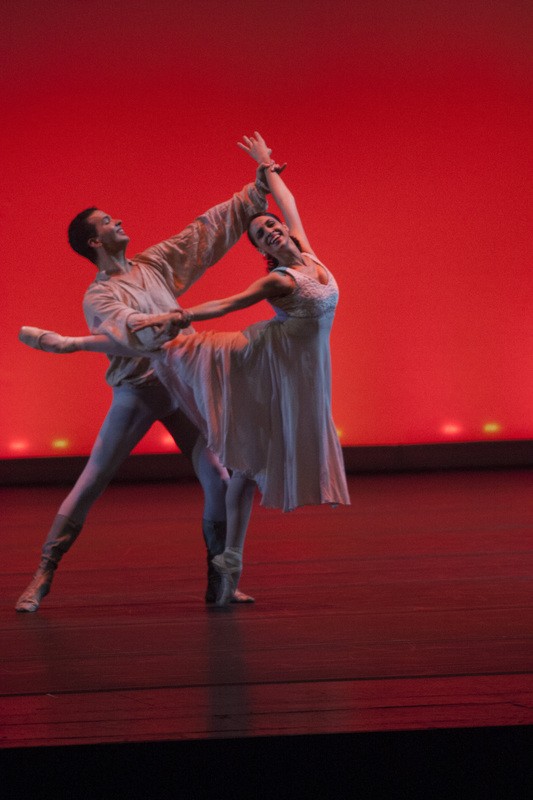 They remained intertwined throughout much of this gorgeous ballet. When they did part, standing still facing each other, the emptiness between them was as powerful as the sorrow in the music. As the lights dimmed, we were left with a sadness befitting an elegy. 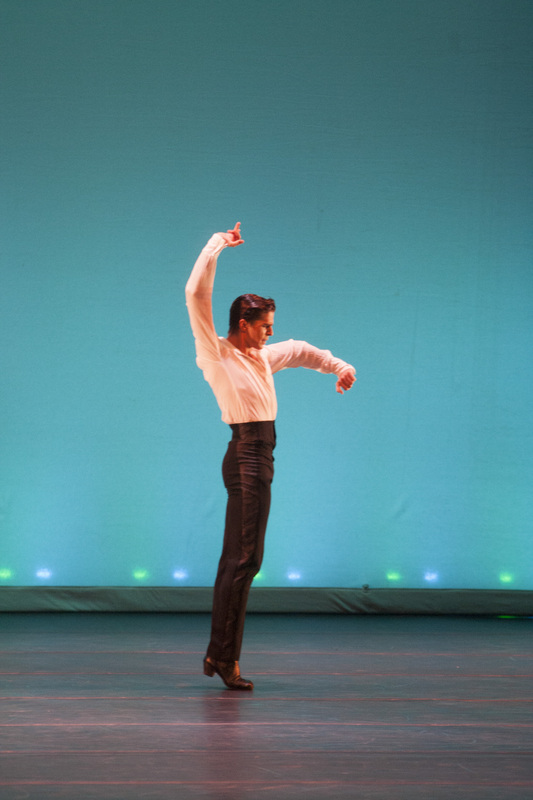 “Adagietto” was presented by the Ballet de L’Opéra National de Nice (France); Artistic Director: Eric Vu An and Choreography by Oscar Araiz; music by Gustav Mahler. “Adagietto” took place before a purple background with the dancers dressed in green. This dream-like duet suggested the fluidity of calm water. The movements were liquid, poured from one beautiful movement into another. The female dancer arched over her partner, was lifted, and then seemed propelled into the next movement like a wave gently cascading towards the shore. “La farruca del Molinero” had it all: the matador, the red cape, and the arms held overhead poised for the kill. The dancer was straight, his head held high and proud. The footwork a series of rapid jabs. This was a piece from the tierra of Spain. There was nobility, a pride radiating up from the feet. It was flamenco at its finest. For too brief a time we were transported to Andalucia and experienced its ancient dance; we were in the spiritual heart of Spain. The Company, from Korea, presented “What About Classical Movements” created by Kim SunHee, Artistic Director and Choreographer, with music by Sergei Prokofiev. The piece offered a study in ballet classicism, beginning with four female dancers in white tutus executing an elegant ensemble segment. Their pointe work was impeccable. They displayed clarity and precision in their pirouettes and grands jetés. The dancers were joined by a solo male dancer in a white tailcoat who prepared the way for three other male dancers with effortless beats and turns. “What About Classical Movements” spotlighted the male dancers. As elegant as the women were, the men dominated the stage. They executed their soaring leaps perfectly and held suspended in the air, landing only for a moment. Their second-position turns displayed speed and vitality. The piece was filled with moments of beauty and joy and was performed with a deep understanding of classical movements. The Closing Gala also included companies from Argentina, the Netherlands, Hungary, Italy and Mexico, giving impressive performances. Italy presented “Steel” from the Teatro Alla Scala Ballet Company; Artistic Director: Makhar Vaziev; Choreography by Gianluca Schiavoni; Music by Sool. It was a bold, tongue-in-cheek take on the barre exercises every ballet dancer goes through. The solo female dancer was dressed in a jazz costume complete with sequins. She placed herself over the barre, under the barre and wrapped around the barre. “Steel” gave us a glimpse of the rigorous training that leads to what we witness on stage. The closing ceremony also paid homage to Jean-Pierre Pastori, who received the festival’s “Criticism and Culture of Ballet” Lifetime Achievement Award. Pastori is a Swiss-born ballet writer and critic who contributes to several Swiss newspapers and is presently working on a book on the work of Maurice Béjart, a French dancer and choreographer. The Closing Gala was filled with an abundance of talent and bravado and, well, with duende, the Iberian term for passion, inspiration and soul. It ignited the performers, reached beyond the stage and lifted our spirits.